Hosted by Travelocity.com.mx and the Mexican Council for the Promotion of Tourism (CPTM), this online competition featured weekly match-ups between 14 competing Mexican destinations this summer. Travelers were asked to vote for their top pick in four travel categories, including Family Beach, Luxury Beach, Urban City and Colonial Town. More than 2.3 million people living in cities and towns throughout Mexico cast their online ballot for Mazatlán in the battle for Best Family Beach Destination, held during the week of July 1. With a grand finish of more than 73 percent of votes, the seaside destination known as “The Pearl of The Pacific” celebrated a landslide victory over the rival beaches of Cancún, Acapulco and Ixtapa. Mazatlan garnered more than half of the total ballots cast in the Battle of Destinations. The competition drew a total of nearly 3.9 million votes in all four categories. 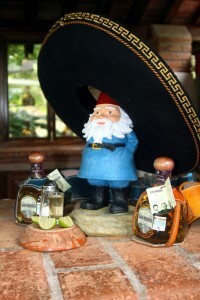 To find Mexico’s top spot for authentic culture and miles of scenic coastline, travelers in the know follow the gnome. Mazatlán welcomed Travelocity’s roaming gnome to its shores on July 9 – 11. The tiny traveler was on hand to present the honor for Best Family Beach Destination during a special award ceremony, accompanied by Rodrigo Cobo, Director General for Travelocity México. Raúl Llera Martinez, Undersecretary of Tourism Operations and Promotions for the State of Sinaloa, accepted the award on behalf of Mazatlán, with Mazatlán Hotel Association and Tourism Board members attending. Following the reception, the gnome ambassador set off to explore Mazatlán’s renowned beaches and cosmopolitan tourism district, known as the Golden Zone. Many of the luxurious resorts here have completed upgrades and extensive renovations to showcase award-winning spas, high-tech fitness centers, championship golf and nightlife. Premier restaurants serve up gourmet cuisine with panoramic sunset views, while the oceanfront malecón promenade offers a taste of Mazatlán’s fresh Pacific seafood in outdoor markets and beachside palapa huts. Just north of the Golden Zone, the gnome made a stop at the state-of-the-art, $70 million-dollar Mazatlán International Center and new growth as part of the Marina Mazatlán project – at more than 15 square miles, one of the largest urban and tourist developments in Mexico and Latin America. Marina Mazatlán’s master plan calls for new high-rise luxury hotels, residences, gourmet restaurants, spas, shopping and recreational areas. The Marina Mazatlán Golf Course recently debuted the first nine of its 18-hole course, designed by David Fleming. Ecoadventure and pristine scenery were among the highlights of the gnome’s excursions to nearby colonial towns in the Sierra Madres foothills. In the mountain village of La Noria, this savvy traveler explored the 130-year-old La Hacienda De Los Osuna tequila distillery and plantation. Daily walking tours take guests through the agave fields, where plantation guides explain the growing process and demonstrate how the blue agave is harvested before touring the ancient and modern distillery. Afterward, the gnome took off on a heart-pounding zipline tour through jungle treetops as part of the Huana Coa Canopy Adventure. Rich culture awaited the gnome back in Old Mazatlán, home to more than 479 national historic sites like the 135-year-old Angela Peralta theater and bustling Pino Suárez open-air market, which has operated since 1899. In Plaza Machado, the gnome joined visitors and locals strolling alongside unique shops, art galleries, jazz clubs, museums, contemporary dance studios and outdoor concert halls. Old Mazatlán’s sidewalk cafés featured al fresco dining against a colorful backdrop of neoclassical architecture. To follow the Travelocity gnome’s adventure in Mazatlán or for more information on the Battle of Destinations, visit www.batalladedestinos.com or www.gomazatlan.com. Mazatlan distinguishes itself from the rest of the Mexican beach destinations because of its rich history and also because it is a city concerned about its image and its culture. This extraordinary combination of beautiful beaches, awesome natural attractions and luxurious hotels, together with a wonderfully preserved historic center, a variety of cultural events and the warm hospitality of the people gives Mazatlan a unique balance. A beautiful place in Mexico. We visited Mazatlán when we went to spend our holidays in Riviera Nayarit. . I must say, we were completely blown away by the beauty of the sea. Riviera Nayarit Hotels are beautiful, comfortable and have a magnificent view of the pacific ocean. Definitively, it’s heaven on earth. And finding accomodation was quite easy through online Deals Destinations. There are no excuses to visit this beautiful place!